Two thoughts struck me simultaneously as I watched Srijit Mukherjee’s latest work open-mouthed and stunned: this is the most original thriller I’ve seen in Indian cinema, and that some of the best work in Indian cinema is happening outside ‘Bollywood’. Interestingly, ‘Bollywood’ does come up for discussion in the course of this vastly intriguing thriller when the make-up artiste, pet-named Vinci Da for his affinity to the art of Leonardo da Vinci, comments on budgets for Bollywood cinema being unaffordable in Bangla cinema. It’s hard to say anything about the plot without giving away the devastating twists and turns. But the one thing that can be said safely is we have never seen anything like this before. The interactive drama about a serial killer who has the mind of a brilliant lawyer, and a make-up artiste, played with visceral force by two of the country’s finest actors Ritwick Chakraborty and Rudranil Ghosh, is so fraught with a feral acuity, we are often left looking at situations and circumstances that seem ripped off newspaper headlines and pinned to the macabre vision of Wes Craven. As the serial killer Adi Bose, representing what criminologist Colin Wilson called ‘genius gone the wrong way’ snares the goodhearted idealistic make-up artiste into a bizarre web of crime, Mukherjee straddles the two worlds of terror and tenderness without losing his firm grip over the narrative. There are bouts of bestial brutality that reminded me of the sudden spurts of violence in Mukherjee’s “Rajkahini”. Then there is the tender passion between the make-up artiste and his speech-challenged beloved Jaya (Sohini Sarkar). Their scenes together are suffused with the incense of an innocent attraction. It is a sight to behold when the narrative fuses the brutal violence with the tender innocence. Speaking of ‘incense’, it is no coincidence that the word means anger and also those religious sticks that one has to light up to experience the heady fragrance. At the end we are are left with only the fury and fragrance mingling in a union that is both shocking and exhilarating. “Vinci Da” is a remarkable work for the way it blurs the lines of morality to show how easily a clever man can jump from the right side to the wrong. And how weak can be manipulated by the strong. It’s also remarkable for showing the close relationship between crime and art, and between the criminal and his conscience. 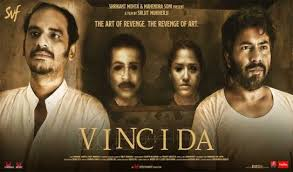 “Vinci Da” breaks every glass ceiling that the ‘thriller’ genre in India has ever encountered and savours the shards as they penetrate the very core of the concept of crime and atonement.